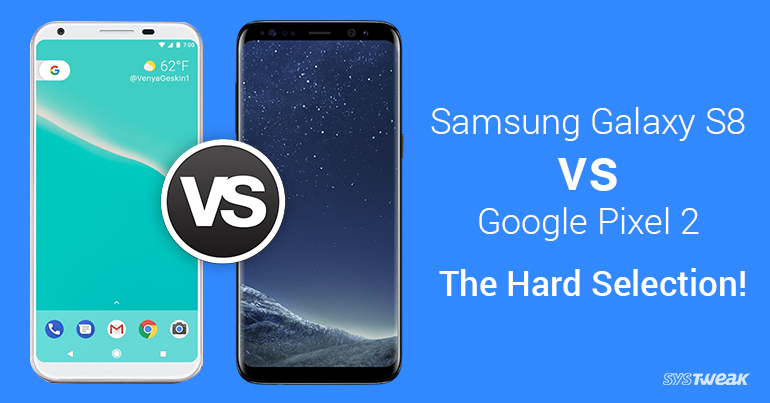 Samsung Galaxy S8 vs Google Pixel 2 – The Hard Selection! Android smartphone market is indeed a competitive one. Manufacturers continue to ruthlessly research new technologies and features they can offer in their smartphones. Presently, the smartphone industry isn’t going to stop unearthing more features anytime soon. Though this competition helps you get newer and better features, it is also causing frequent switch of phones. Google and Samsung are nowhere far in this cut-throat competition and have their respective next-gen flagship models in the market. Where Samsung has introduced Galaxy S8 and S8 Plus, Google also unveiled Pixel 2 and Pixel 2 XL. Although, both products have something unique to offer you. Let’s take an overview on both the phones and decide the best for you. Samsung Galaxy S8 simply beats Google Pixel 2 by providing much larger screen size being the same overall size. Google Pixel 2 has a larger bezel than the S8, which cannot be overlooked. Where Samsung Galaxy S8 offers you a 5.8inches of display, Google Pixel 2 is far behind at 5 inches. However, screen is just a part of the device and there’s a lot more to discuss. Samsung and Google are using the same processor for their flagship product. Galaxy S8 and Pixel 2 are geared with Qualcomm Snapdragon 835 processor, which is 35% smaller and uses 25% less power than its previous design. Surprisingly, both the phones don’t offer dual rear cameras; however, the only camera provided is enough to kindle your moments. Samsung Galaxy S8 has a Rear 12MP with OIS and a front 8MP camera. On the other hand, Google Pixel 2 gives a slight upscaled 12.2 MP rear with OIS and an 8 MP HD front camera. As far as resolution is concerned, Samsung Galaxy S8 renders a 2,960 x 1,440 pixel with 570 pixels-per-inch and Google Pixel 2 shows you at 1,920 x 1,080 pixel with 441 pixels-per-inch. Google Pixel 2 clearly wins the race of advanced operating system by launching Android Oreo. Whereas Samsung Galaxy S8 is equipped with the current Android OS Nougat. Oreo is said to be better with small but beneficial changes that include Autofill Framework and multi display support. If you’re into movies, both the smartphones are capable to store a good volume of your favorite movies and shows. The ROM provided in Samsung Galaxy S8 is 64 GB in the USA and 128 GB international. On the other hand, Google Pixel 2 offers a plain 128 GB globally. Beating every doubt, you’re not going to run out of space. As far as the power is concerned, Samsung and Google are real close to each other. Where Samsung Galaxy S8 is loaded with a 3000mAh battery backup, Google Pixel 2 is 2700mAh. The backup may look pity, its able to serve you for long enough. In case it runs out, both the phones have a USB type C charger port for a refill. Samsung and Google are indeed the tech giants and clearly the real players of Android smartphones. When it comes to different sensors, Galaxy S8 is equipped with Barometer, gyroscope, accelerometer, compass, heart rate, proximity sensor, iris scanner with an IP68 water resistant. However, Google Pixel 2 is loaded with almost same sensors with Active Edge. Overall, both Samsung and Google have played their best bet on S8 and Pixel 2. If talk about cost, S8 would cost $725, whereas Pixel 2 would be of $650. You can pass a verdict based on price, specs and design. We hope these details help you to make a better choice between the two.